Although I did not meet Les until 1989, he told me he had been playing the converted 4-string piccolo bass for about 10 or 12 years before that. During that period, due to illness, I had all but given up building instruments. Gary Kelly, a local bassist and dear friend, kept bugging me to build him a six string bass. After several months I decided to give it a try. That instrument was the first one to have the extension on the bottom where the strings go through the body. 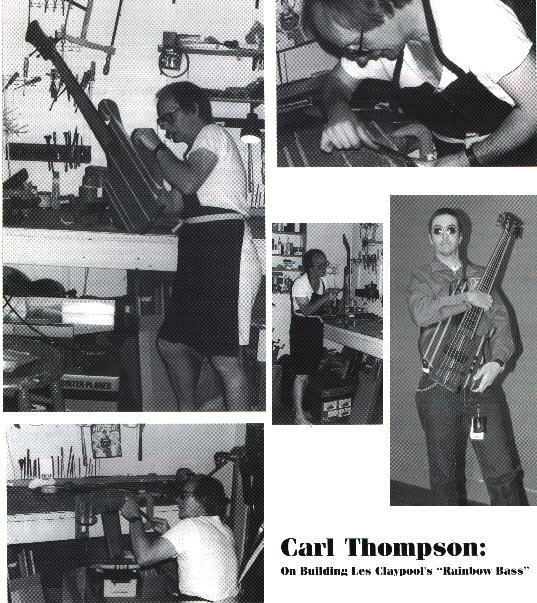 Later on I built Gary a six string fretless. I am not sure if it was in 1988 or 1989, but Les met Gary along with another friend and bassist, Ernie Provincher, who also had one of my earlier four strings at the NAMM show. They gave him my number, and Les called, and he and Larry came to my apartment to discuss building his bass. Actually, as I recall, we didn’t talk about the bass that much. Mostly we talked about his love of sailing and fishing and my love of jazz music and harmony. Come to think of it, the only thing Les said in regards to the bass was that he wanted a six string fretless with one pickup. After spending the better part of a day with Les, I assessed that he was a “Wild and Crazy Guy”, so why not make a “Wild and Crazy Bass”. The idea for using all of those kinds of wood came from a guitar I had built in the 70’s. That particular guitar was made from scraps of wood left over from other instruments we were working on. Mike Parisi, a young man who was working with me glued all of the pieced together, butcher-block style, and we made a neat little guitar. I called it the rainbow guitar because of all the different colored woods. I figured that would be a good “Show Piece” for Les, so I built him the “Rainbow Bass”. Space does not permit me to discuss all the detail that went into building that instrument. Let’s just say “Wowie-Zowie” in the vernacular of Les Claypool. The neck blank for the bass was assembled by Ron Blake. Ron is a superior craftsman who has been with me since 1976. The shaping of the neck and all the bodywork was done by me in my kitchen here in Brooklyn, which was my workshop at the time. I can assure you it was not easy! After Les played the bass for a few months, he decided that it didn’t quite balance for him. I cut the top horn off, added some wood and carved the scroll you see today. In his first video, Les is seen playing the bass without the scroll, in its original form. A lot of people ask me if I had built two “Rainbow Basses” for him-no, just the one, with a few modifications. I stated earlier that I though Les was a “Wild and Crazy Guy,” and no doubt he is! I also think he is extremely talented, bright and caring man. So if you young bass players are looking for a hero, from where I sit you couldn’t do better than Les Claypool. Recently I received a package from Primus, I thought, maybe some thing happened to one of his basses. I wasn’t sure what it could be. To my surprise when I opened the box, it was a Gold Record dedicated to me from Primus’ Tales From The Punchbowl. What a guy!